What was the true reason for the second of the Ten Commandments? Why did people die when they touched the Ark? Why were the Israelites required to perform sacrifice? Why doesn’t the word “holy” mean “holy”? What is the soul and where is it located? Amidst the strident contemporary debates over the primacy of religion vs. science, author Roger D. Isaacs has written a volume that explores dramatic connections between these often adversarial camps. Talking With God is an assembled jigsaw puzzle interweaving science with the Bible to offer a radical new understanding of key words and phenomena in the Hebrew Bible. 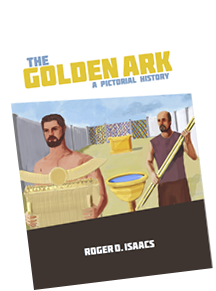 While the Ark of the Testimony was in use, from Moses to the reign of King David, the Israelites reported terrifying, even fatal encounters with the Ark. They used the common terms of the day, but their original descriptions have suffered the misconstruing and, therefore, faulty translation that comes from the evolution of language over time. 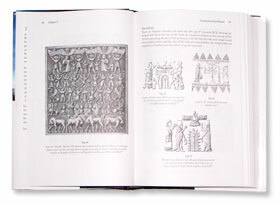 Through his extensive research in digs, museums, and libraries in several countries, including Syria, Jordan, Turkey, Egypt, Israel, and England, Isaacs has discovered related and loanwords in 18 ancient languages that, when associated with their Hebrew neighbors and assembled, clarify the intent of the early scribes who relayed those events in the Bible. Dr. Byron Sherwin, Distinguished Service Professor, Director of Doctoral Programs, Spertus Institute of Jewish Studies. a jeweled apparatus worn by the high priest with a breastpiece, an ephod, and Urim and Thummim. Talking With God reaches entirely new conclusions about not only these puzzling laws, but also many of the terrifying Ark related events conveyed by first hand observers. 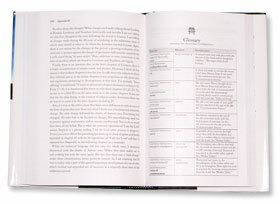 Key words used in their descriptions, such as the Hebrew words translated “holy,” “glory,” “unclean,” and “sin,” do not seem to have these meanings. In many cases, by researching related words in neighboring languages, e.g., Assyrian, Babylonian, Eblaite, Greek, Egyptian, Hittite, Sumerian, Ugaritic, etc. their true meanings are revealed. 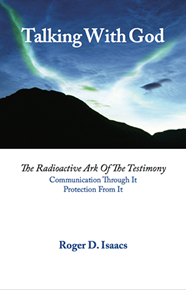 the Ark’s radioactivity that constantly threatened the Israelites as they crossed the Wilderness over 3,000 years ago. Whether or not you take the Bible literally, you will see that what happened to the ancient Israelites was documented incorrectly and is now at the heart of many of the world’s major religions. 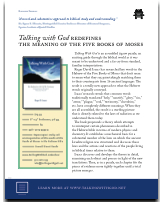 Download a free chapter of “Talking With God” along with other parts of the book.